Honda is really trying to do new things in the motorcycle realm, which may be interesting, or may miss the mark. The top is the Honda NeoWing concept, a hybrid reverse trike with a KEY feature, leaning front suspension, where others don’t lean, and also has a modest front track width, narrower than Can Am Spyders. It also features a flat-4 engine derived from Goldwing’s flat-6, with added electric hybrid drive, and presumably could have an electric reverse gear. 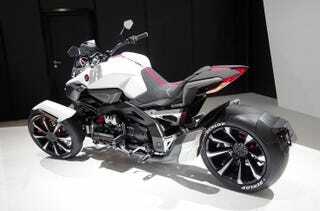 The lower bike is a new generation NM4 Vultus, a new 750cc parallel twin with dual-clutch gearbox, low seat height, and forward recumbent foot position. No foot controls aside from an auxiliary brake lever, no clutch, and linked front and rear ABS brakes from the right handlebar, and button shifting programs. The parallel twin with a 270-degree crankshaft also fires more like a V-twin with a wider spread between power strokes than a big-bang 360-degree or narrow-then-wide interval 180-degree crankshaft. One looks like an angry Decepticon, the other looks a bit smoother, but still like a science fiction space oddity. The thing is... these two could be combined, and be a killer new product, if executed correctly, and with open minded customers. The recumbent position is interesting, and Can Am is doing something similar on their non-leaning F3. Low seat height, forward controls, more like a seat in a car, but out in the open. The reverse trike stability and virtually complete prevention of low and high side single-vehicle motorcycle accidents, especially on imperfect pavement is a BIG thing, but counter steering and lean-into-turn behavior has been missing. Neowing has it, where Can Am does not. Mix and match the parallel twin, flat four or flat 6 engines that Honda has in inventory, as well as dual-clutch tech, and maybe throwing optional mild hybrid drive into the mix... there is a lot of flexibility on how to power such a vehicle. The styling of the NM4 Vultus is weird, but is slightly smoother than the front end of the NeoWing concept... and could be further smoothed... and the low, flowing, seat-forward styling of the Vultus would really suit a reverse trike, rather than more upright traditional motorcycle styling with everything mounted above a single front wheel, at the top of the front suspension, like a Goldwing. The only thing I would add to the mix, with a tilting front suspension, would be an articulated front steering linkage, where the sidestick-like hand controls move on their own pivots, inverse-linked to each other, where pushing one hand control lever forward acts to bring the other lever aftward, and both in concert turn the steering system and act on the front suspension. The articulation linkage could be under the bodywork, with only the top of the levers, and hand controls exposed, with the central area between them open for gauges, lighting, and other information systems, or a tablet/smartphone mount.